I'm rather amazed that it took so long for the DRAGONBALL franchise to be made into a live action movie. I suppose the studios have had plenty to do pillaging the 60s and 70s for all their worth. While those decades are still being ransacked, Twentieth Century Fox decided to bring some 80s/90s nostalgia to the big screen as well. The genesis of DRAGONBALL goes all the way back to a simple, Japanese, manga-series of 1984, which has since evolved into a mega-franchise including: several animated series, trading card games, and video games. Actually, DRAGONBALL EVOLUTION is the second, live-action movie, but it's 1989 predecessor, DRAGONBALL: THE MAGIC BEGINS was a Taiwanese production that saw no theatrical release outside of China. Perhaps only the heartiest of DRAGONBALL fans even recall this film some 20 years later. Since the first glimpses of DRAGONBALL EVOLUTION hit the internet, it's safe to say that expectations, by mainstream audiences, were unsurprisingly low. Just as video-game-to-feature-film adaptations fall into the 80/20 failure rule, so it seems to be with manga/anime-to-feature-films. If the 1989 Dragonball film wasn't evidence enough , then we only need look to efforts like DETROIT METAL CITY, FIST OF THE NORTH STAR, or DEVILMAN as convincing additional evidence. 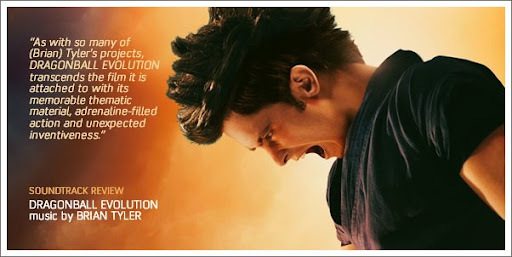 Unfortunately, DRAGONBALL EVOLUTION doesn't manage to avoid a couple of the standard pitfalls of its predecessors such as: poor writing, second-rate production value, and the like, but it does turn up two surprises. The special effects are leagues ahead of what one might be expecting and BRIAN TYLER's heroic, symphonic score delivers some much needed emotional weight to the otherwise flimsy film.